Almost everyone who passes through the gates at Disney’s Hollywood Studios is familiar with the celebrity hands-in-cement that grace the courtyard of the Chinese Theater, right at the entrance to the Great Movie Ride. 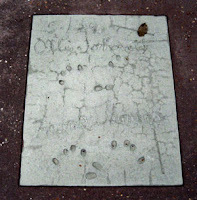 But most guests don’t know that there is another courtyard honoring some of the greatest actors in movie history. 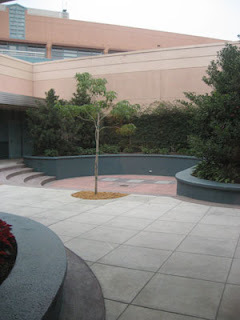 This courtyard is in a secluded, practically off-limits area of the Magic of Disney Animation, and contains the handprints of legendary Disney animators. Recent guests to Disney’s Hollywood Studios may not realize that once upon a time, the Magic of Disney Animation was a full-blown tour experience, and not just a brief Mushu movie followed by character meet-and-greets. The original tour allowed guests access to the courtyard, but the most recent configuration (in place for many years now) has routed everyone immediately into the Mushu movie. Guests could glimpse the courtyard off to the right as they herded into the theater (and again from windows while exiting the building), but rarely would anyone think to bail from the line and take a peek at the three unassuming blocks of concrete just a few paces away. The blocks have certainly aged with time, and these photos were taken on a cloudy day, making them hard to read. 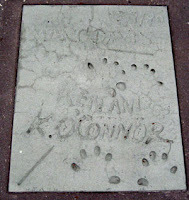 But these are the handprints of Disney legends Marc Davis, Frank Thomas, Ollie Johnston, Ward Kimball, and Ken O’Connor. 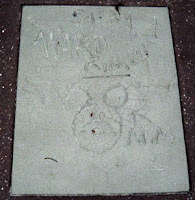 Two of the blocks are etched with a date: 5/1/89, coinciding with the opening of the Studios park. Note how each block also contains the impression of a pencil, a fitting tribute to the art of these great men. Incidentally, on the day I took these pictures, the Magic of Disney Animation was experimenting with two lines. The main line led as normal into the Mushu movie, but the second line bypassed that theater and allowed guests into the postshow. This second line passes much closer to the courtyard, and is not really a line so much as a pathway, making it possible (at least for the short term) for guests to hop down into the courtyard and get a look at the handprints. This entry was posted in Lost and Abandoned Disney Details and tagged Disney's Hollywood Studios, Magic of Disney Animation. Bookmark the permalink.